Thought there might be some life in here on a thursday night..... Sadly mistaken. Although thry did have a spare daily mail. Hoped for fun, got saduko. At the top of a long hill in the town center. After pushing a w/chair all that way a larger was welcome no real ale. A dark perhaps depressing interior, not one of my favourites. 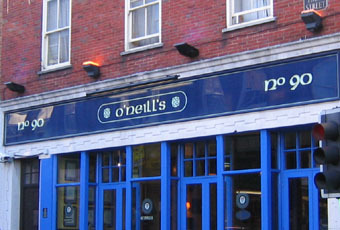 If you use O'Niells then this as per usual, nothing special. Loving the Live music on Thursdays! Cheap and nasty ! old format, matched only by the 'attitude' of the staff! terrible. NAFF! horrible food, dirty bar and toilets - i would not eat there ever again. as for the beer, cheap and horrible. Go find (plenty) of other nice bars in winchester.